When you need to repair a tooth, you should not have to sacrifice appearance for the sake of strength or longevity. That’s why Park Slope cosmetic dentist Dr. Sapienza and his staff at The Dental Spa of New York provide cosmetic dental services that are beautiful and enduring. Let’s consider some of the treatments that may be appropriate for repairing and enhancing your smile. One of the most commonly necessary restorative procedures Park Slope dentist Dr. Sapienza provides is a white filling to repair a cavity that results from tooth decay. For decades, the only option for repairing a cavity was an amalgam filling that was made of silver, tin, copper and mercury. These fillings did the job, however, they left an unavoidable dark spot in your smile. Today, Dr. Sapienza uses composite resin materials to fill a cavity. Made of medical grade plastics and glass, this material can be blended to match the color of your tooth. Moreover, composite resin bonds with the remaining tooth structure and makes the tooth stronger. For missing teeth, Dr. Sapienza can design a crown and bridge that will look and feel natural. Healthy teeth on either side of the gap in your smile are prepared for crowns. In turn, these crowns support the false teeth that actually bridge the space of missing teeth. We work closely with ceramists in our dental lab that fabricate bridgework to match your other teeth and fit comfortably in your mouth. A crown and bridge can be a replacement for one or several consecutively missing teeth. Another viable option for tooth replacement is dentures and partials. A denture replaces all of the teeth along the upper or lower arch of teeth, while a partial is designed to replace a few missing teeth. A partial consists of false teeth that are mounted on a base designed to look like your gums. Held in place by clips or brackets, your partial can be made to fit like a puzzle piece between your other teeth. Like a partial, a full denture is also made of false teeth attached to a gum-like base. However, this prosthetic fits comfortably over your gums and is held in place by a combination of suction and the muscles of your cheeks and tongue. A denture adhesive can be used for added security. If you would like to have your smile enhanced with cosmetic dentistry that is attractive and restores your smile, then call The Dental Spa of New York. 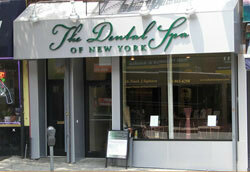 The dentist Park Slope trusts conveniently serves patients from the surrounding communities of Brooklyn Heights, Cobble Hill, Prospect Heights and Carroll Gardens and other areas of Brooklyn and Queens.